Fire-i™ Digital Board Camera is a board-level fully operational FireWire 400Mbps camera, complying with IIDC specification for industrial uncompressed VGA picture acquisition. Built around Texas Instruments 1394 digital camera chipset and Sony® Wfine CCD sensors, it is a high quality subassembly for OEM use. All models (Color, Black & White) of Unibrain’s Fire-i™ Digital Board Camera can be produced with the unique feature of a Remote CCD connected to the main board via a high reliability and density 6-inch flat cable. This is a new revision of the Fire-i™ board camera in which the daughterboard that hosts the second firewire port has been eliminated and instead the two firewire ports are now soldered on the main camera body. Operates with any 3rd party IEEE-1394 PCI or PCMCIA (CardBus) OHCI compliant adapter or any Desktop/Portable PC or Mac with built-in FireWire support. 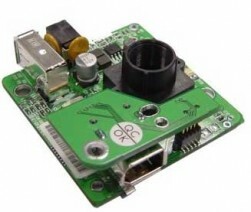 Fire-i™ Digital Board Camera is powered by the FireWire bus DC voltage, coming from host adapters or other FireWire devices connected with 6-pin cables. when, in 6-pin, no powering device is present, even from the FireWire interface. This is the case when using CardBus FireWire adapters or on some laptops with built-in interface. Even if the FireWire bus is already powered, the DC power input jack of the camera can also be used to reinforce it. 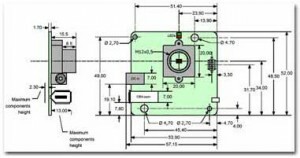 The FireWire bus voltage will adapt automatically when needed. A built-in diode avoid any risk of voltages conflict or reverse current flow. Recommended DC adapter must provide stable regulated output voltage of at least 12V DC,1A. 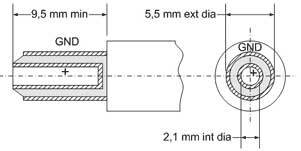 To match camera DC input connector, the jack plug of the DC adapter need following dimensions and polarity as on the figure. (Sony color CCD, 400 TV lines). (Sony monochrome CCD, increased resolution 480 TV-lines, increased sensitivity, close IR sensitivity). (Sony color CCD, resol.480 TV-lines, streams like monochrome, color processing by user (software)). (Includes board camera, 2m 1394a cable, CD with drivers and Fire-i camera control application). (Includes board camera, 2m 1394a cable, CD with drivers with drivers and Fire-i camera control application). From here, you can download all technical documents that can help you in using Unibrain board cameras.